A crowd of about 100 gathered in the Melaque jardin to attend a ribbon-cutting ceremony for the opening of the long-awaited office of the National Migration Institute (INM) in the town. Local, state and federal officials joined nationals and foreigners for the event. 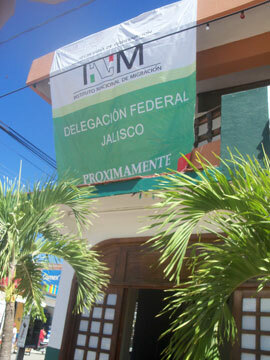 Changes in INM policy were implemented recently that preclude Jalisco-based residents or visitors from renewing their visas in Manzanillo, Colima. Since then, all renewals have been processed in Puerto Vallarta or Guadalajara. It was subsequently decided by INM officials that there were enough foreigners in the Barra de Navidad-Melaque area to warrant the new office. The office is located in the Melaque municipal building and will be open from 9 a.m. to 4 p.,m. on weekdays.